Marred by violence and myriad fraud allegations, the credibility of Nigeria's state and presidential polls could lead the already troubled country into more uncertainty that may reach well beyond its own borders. An election day truck bomb aimed at the Nigerian electoral commission headquarters, meant to taint the country's electoral process, failed to go off. Instead, it was organizational chaos, violence and fraud that combined to deal perhaps a fatal blow to the credibility of what should have been landmark elections in Africa's most populous country of 140 million. Two votes set apart by a week were meant to elect 36 state governors and legislatures on 14 April and a new president and national assembly on 21 April. If successful, it would have been the first time one elected government transferred power to another elected government in oil-rich Nigeria's military-dominated, post-independence history. While more than 20 people were killed in election day violence during the first poll, the presidential poll was much calmer, but perhaps even more fraudulent, observers said. "The presidential election was less violent compared with the governors' race last week, because Nigerians are more concerned over state issues, the things that affect their lives more directly," Charles Dokubo, a senior researcher for the Nigerian Institute for International Affairs, told the Christian Science Monitor on Monday. "When it comes to the central government, most Nigerians believe the battle was already lost before it began. Their vote does not change anything." While President Olusegun Obasanjo's ruling People's Democratic Party (PDP) - which has taken a comfortable lead - and the government-appointed Independent National Electoral Commission (INEC) hail the elections as free and fair, independent observers and opposition parties are unanimous in condemning the vote as fatally flawed. According to the Transition Monitoring Group (TMG), a coalition of election monitors drawn from local civic groups, the 14 April vote was so flawed that results in at least 10 states should be deemed unacceptable. The group also said that in the 21 April polling, voting either started late or did not take place at all in half of the country. "We are calling for a repeat of the elections because you can't declare the president with results from only half of the country," Innocent Chukwuma, chairman of the TMG, which has some 60,000 observers across the country, told ISN Security Watch. Irregularities observed during state elections were significantly worse during the presidential vote a week later, said the Washington-based International Republican Institute (IRI), which sent 59 monitors to Nigeria. The group concluded that the elections failed to meet standards it had observed around the world, including other African countries. "Recurring incidents included under-age voting, voter registration list errors, stuffed ballot boxes, group voting, party observers and police instructing individuals on who to vote for, lack of privacy for voting, lack of results sheets and other materials, falsified results sheets and early closings," said the IRI in its preliminary report on the presidential ballot. "Neither the spirit of Nigerians who went to the polls to cast their ballots nor the dedication of the thousands of poll workers struggling to execute their responsibilities in polling stations throughout the country were matched by their leaders," the group added. Ahead of the Saturday presidential vote, a coalition of 20 opposition parties had called for the cancellation of the first ballot that handed victory to the PDP in 27 of the country's 36 states. After initial threats to boycott the presidential vote, they agreed to participate in order to have grounds to challenge what they said would be a flawed outcome. With the ruling party candidate Umaru Yar'Adua taking an early lead, the top two opposition candidates - Muhammadu Buhari of the All Nigeria People's Party and Vice President Atiku Abubakar of the Action Congress - have both declared the election as unacceptable. "Now that we have participated and seen the level of fraud, we will compile our evidence and challenge the election at the courts," said Buhari. Abubakar also vowed to challenge the results, describing the poll as the "worst election ever." "All that we are saying is that this president, this INEC, lack the credibility, the impartiality to conduct a free and fair election for Nigerians to express their will," said Abubakar, who fell out with former political ally Obasanjo after he helped stop moves to lift the two-term presidential limit to keep him in office. The split between Obasanjo and Abubakar spawned a bitter power struggle that forced the latter out of the ruling party, with Obasanjo later backing Yar'Adua, a little known state governor from the country's mainly Muslim north, to succeed him. Obasanjo also tried to stop Abubakar from running for the presidency using allegations of corruption cited by the electoral commission to disqualify him. However, the vice president mounted a legal challenge to his disqualification which paid off when the Supreme Court ruled within days of the election that his name be put on the ballot. By then the seeds of the organizational chaos that plagued the elections had been sown. Despite all the criticism, INEC chairman Maurice Iwu praised the poll, saying: "I do not know any other country in the world that would have done it better. "We were able to print 65 million ballot papers in three days, had them flown into this country and distributed for an election. It is a tremendous effort and Nigeria should be praised for it." The effort was apparently not good enough as election materials either arrived late or failed to arrive at all in many parts of the country, according to witnesses, voters and election monitors. In the face of widespread criticism of the organization of the ballot, the government has in turn accused the opposition groups of trying to create the atmosphere for a military takeover and warned that it would take action against any such moves. The immediate signs are that the political battle will shift to the parliament and the courts. Senate President Ken Nnamani, a strong critic of Obasanjo, has recalled senators now on recess to meet on 24 April to deliberate on the conduct of the elections. The parliament has the power to remove Obasanjo from office and appoint an interim government to organize fresh elections. Information Minister Frank Nweke is accusing Nnamani of seeking Obasanjo's ouster to "satisfy his inordinate and megalomaniac ambition." But opposition candidate Buhari wants the senators to remove Obasanjo for the sake of Nigeria. Regardless, few are holding out much hope in any of the three presidential candidates to foment positive change in Nigeria plagued with poverty, rampant corruption and unrest. "All the candidates are tired old faces on Nigeria's political scene, reminders of the country's failed and militaristic past. All come with plenty of baggage," the British weekly magazine, the Economist wrote, pointing to the dubious or not corruption charges against Abubakar and the opposition's Buhari, who is most remembered for his political oppression as a former president and general. In the meantime, with Nigeria teetering on the edge of a major crisis, analysts fear the ramifications will go far beyond the country's borders. Nigeria is the world's eighth-largest oil exporter and there are fears a growing insurgency in the main oil-producing Niger Delta region will intensify with a prolonged political crisis, damaging global oil supplies. 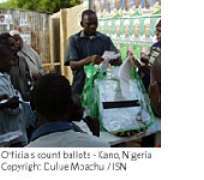 Fighting between the two ballots pitting security forces against Islamic fundamentalists in the northern city of Kano underscored the sectarian fault-lines in the multi-ethnic country, which is roughly evenly divided between a mainly Muslim north and a largely Christian south, with a history of one civil war and bouts of ethnic and religious violence.